And secondly that, as well as commissioning specifically written soundtracking, he well is known for sourcing a lot of his movie music from what’s already out there. Indeed, much mention was made, in all the articles I read, of Scorsese’s “Golden Rule” of soundtracking – namely that any existing music featured in a film’s soundtrack must have been released by the year of the specific scene to properly render the film’s setting. 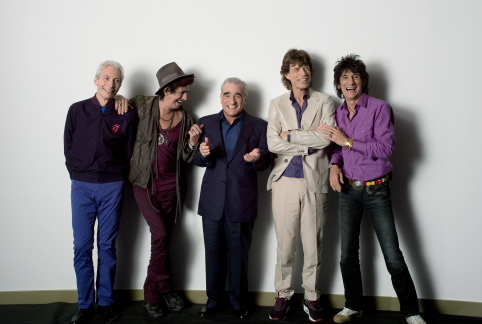 The Rolling Stones are an obvious favourite of Scorsese and, it seems, vice versa. He has, after all, done a music documentary, Shine a Light, about the band and collaborated with Mick Jagger to create the short lived TV drama series Vinyl. “My films,” Scorsese once said, “would be unthinkable without them.” With an impressive 14 different appearances for the band’s music throughout Scorsese’s films, it’s Gimme Shelter that hits all the high notes, being used in Good Fellas, Casino and here, in the opening scene of The Departed. This song was written in for a short lived 1946 Broadway musical, St Louis Woman, and has become a classic of The Great American Song Book, with over 100 different recordings of the song in existence. None is more famous though that the 1959 Ray Charles classic version, the gentle, cheerful swing used to such great effect against the desperate freeze-frame of a fans hand on the window of Jerry Langford’s limo in the opening credits of King of Comedy. Another track that’s used in sharp contrast to the imagery, with the sugary 60’s pop of Phil Spector’s Ronettes jarring wonderfully with the gritty “home movie” reality of growing up in crime-ridden New York in the opening sequence of Scorsese’s 1973 film Mean Streets. And one of the best timed musical cues in film, kicking up just as Keitel’s head hits the pillow. It’s not just modern music that inspired Scorsese. Cavalleria Rusticana is actually a full opera which premiered in Italy in 1890 after being originally written in under 2 months as an entry for a competition run by Milanese music publishers. Here’s Scorsese uses the symphonic Intermezzo over the opening credits of Raging Bull, and the combination of classical music over slow-motion film turns the boxing into something quite balletic. This final track turns everything on its head. This was a song actually written and re-written at Scorsese’s behest, after the original submission got rejected as being “too weak,” by Robert de Niro of all people, for Minelli’s performance in the Scorsese movie of the same name. Now it has grown arms and legs as a standard in its own right, performed by many, many other people, not least Ol’ Blue Eyes himself, Frank Sinatra. Here though is the original as featured in the film.